BBC NEWS | UK | UK Politics | Campbell World Cup blog own goal? Campbell World Cup blog own goal? 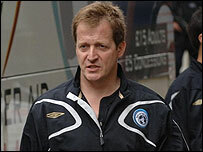 Ex-spin doctor Alastair Campbell has launched an attack on female newspaper columnists who write about football. Mr Campbell has started a World Cup blog, which promises to bring "all the drama and excitement" from Germany. But he kicks off with an attack on "women newspaper columnists suddenly imagining that the world needs to know their views on Ronaldinho". The blog has attracted abuse from some readers, with one man calling it "patronising and insulting". Others leap to Mr Campbell's defence, with "JRWT", of Plymouth, attacking the "narrow minded people" who posted negative comments, saying the blog is "only a bit of fun". Mr Campbell, an ardent Burnley fan, also uses the blog to have a dig at the BBC's Andrew Marr and Nick Robinson. He writes: "Andrew Marr was first into print saying how he doesn't really do the football thing, in which case I wonder if we can't find another planet for him. "And maybe he could take Nick Robinson and all the other political pontificators and they could all two-way to their hearts' contents while on Planet Football we get on with the task of watching every single second of live action available to us." But Mr Campbell, who writes sports articles for The Times newspaper and took part in the recent Soccer Aid event as part of the Rest of the World team, reserves his real venom for female newspaper columnists. He writes: "Within a matter of few days, we will have that four yearly rash of women newspaper columnists suddenly imagining that the world needs to know their views on Ronaldinho. "Or how confused they get that there is a Ronaldo playing for Brazil and another playing for Portugal, who have a Brazilian manager who almost came to England but it never happened because England have to have an English manager but isn't it very confusing because at the moment they have a Swede in charge with a glamorous girlfriend and what a coincidence that England will play Sweden in the opening stages. "Blah, blah, blah. Memo to columnists who have never been to a football match - we don't care what you think. Take a holiday." Mr Campbell also compares prime minister Tony Blair to England manager Sven Goran Ericksson. "The public all have their own individual views of high profile people like Tony and Sven. But whatever those views are, they tend to admire people of strength and fortitude who just keep going," he writes. Mr Campbell's tough talking style has not gone down well with some readers. In one comment, David Smith, of Letchworth, writes: "Your patronising attempt at being 'one of the lads' would be laughable - were it not so sad. "I comfort myself in the certain knowledge that we are witnessing the death throes of the most corrupt government this country has ever known." Another correspondent, Calvin, of Liverpool, attacks the blog as a "right-on promotional exercise" and tells Mr Campbell "you make me sick". Another man writes: "Alastair, if Iran find themselves behind at half time, do you think they'll be able to launch a counter-attack in the following 45 minutes?" Sadiq Khan, Labour MP for Tooting, is also writing a World Cup blog on the Labour Party website.